It may sound stupid and certainly not like something you would read on the SuppVersity, one of the few places on the Internet that has not been infected with "carbophobia", yet, but it's actually exactly what a recent study from the , University of Napoli "Federico II" suggests: Muscular glucose deprivation promotes the activation of mTOR signaling pathway and will thus increase protein synthesis! And no, we are not talking about even more cognitive masturbation and theoretical considerations, here. 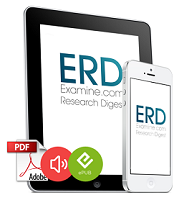 The conclusions Maria Concetta Miniaci and her colleagues present in the latest issue of Pflugers Arch - Eur J Physiol are in fact based on experimental evidence - experimental evidence that is, if you think it through - not contradicting its practical counterpart! Alternating Squat & BP - Productive? Evidence from a rodent in vitro study, but evidence of which not just Miniaci et al. (2014) but also I am confirmed that it is relevant for humans, as well. In a way you may say that Miniaci et al. were inspired by the increased interest in the pro-anabolic effects of blood flow restriction. Corresponding studies using aterial and venous compression, induced by either muscle contraction at high intensity or by pressure cuff will, as the scientists point out, induced "short reduction of blood flow and therefore a reduced delivery of nutrients to the muscle" (Barcroft. 1939; Schwartz. 2000). To test this hypothesis, the scientists investigated the effect of glucose deprivation on mTOR signaling and protein translation in L6 cell line, "a well established in vitro model system for studying skeletal muscle physiology" (Miniaci. 2014); and their results demonstrate that glucose deprivation upregulates mTOR and its downstream target the ribosomal S6 kinase (p70S6K), through the activation of NO/PI3K/Akt/mTOR/p70S6K signaling pathway. Now, the interesting thing is that the observed results are pretty similar to what we see in response to regular resistance training, as well. The "pump induced" occlusion of the regular nutrient flow, as well as the acute (!) glucose deprivation in response to exercise could thus be more than casually related to the post-workout increase in protein synthesis. They could, and this is also what the scientists believe, actually be mechanistically involved in the post-workout increase in protein transport into the skeletal muscle. In that, auxiliary data from the study at hand showed that the post-workout increase in protein synthesis is directly related to an increase in (surpris!) nitric oxide synthesase activtiy (this is the stuff that is not increased by the mere provision of the NOS substrate arginine, so that corresponding pump-supplements pretty useless). As the Italian researchers point out, NOS is activated in L6 cells exposed to glucose deprivation. Why this is the case, however is still unclear. If AMPK is in fact the main link, here, the findings of the study at hand, would - just like previous studies on exercise induced increases in glucose uptake lead us back to one surprisingly positive mechanism, which triggers both, glucose uptake and protein synthesis: Metabolic stress! In this case, glucose starvation and susequent acute increases in AMPK expression during exercise. What is important, though, is that you understand that this is an acute phenomenon - a beneficial effect of short-term glucose deprivation and not a result of running around glycogen depleted 24/7. The latter would not just decrease your training performance significantly. 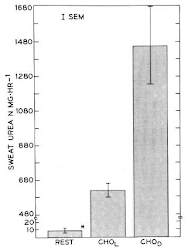 Studies by Lemon & Mullin (1980), for example, show that working out in a glycogen depleted state is associated with an almost 3x increase in markers of protein loss (urea; see Figure 2) compared to the same workout in a glycogen replete state. More recent studies by Howarth et al. which measured the rate of leucine oxidation and other markers of protein catabolism confirm these results (Howarth. 2009), where the net amino acid loss doubled and underline that the last thing you want is to do if you're training for size gains and/or lean mass retention is to train in a glycogen depleted state. 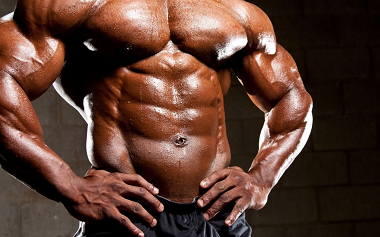 Rather than that, I suggest you take another look at my glyocogen repletion recommendation from a previous article, hit the gym with full glycogen stores and see as the AMPK and NOS expression increases to trigger an increase in glucose uptake and protein synthesis while the glycogen stores are fading during your workout. Remember: It's about cycling high and low levels of energy availability and you certainly don't want to stay on the low end side for more than the few minutes it may take to trigger increases in protein synthesis. Barcroft H, Millen JL (1939) The blood flow through muscle during sustained contraction. J Physiol 97:17–3. Howarth K, et al (2009). Effect of glycogen availability on human skeletal muscle protein turnover during exercise and recovery. Journal of Applied Physiology 17:19. 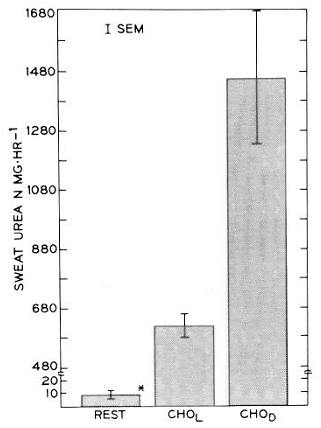 Lemon, PW, Mullin JP (1980) Effect of initial muscle glycogen levels on protein catabolism during exercise. Journal of Applied Physiology 48:624-629. Miniaci, M. C., Dattolo, M. G., Irace, C., Capuozzo, A., Santamaria, R., & Scotto, P. (2014). Glucose deprivation promotes activation of mTOR signaling pathway and protein synthesis in rat skeletal muscle cells. Pflügers Archiv-European Journal of Physiology, 1-10. Schwartz MW, Woods SC, Porte D, Seeley RJ, Baskin DG (2000) Central nervous system control of food intake. Nature 404:661–671.